Hope College has a vibrant campus with 3,407 undergraduates, 80+ student groups and daily events. However, the college's master web calendar didn't get people excited about these events. Departments created their own event listings, such as Google calendars or downloadable PDFs, resulting in several independent event calendars. Since listings were buried in department web pages, people couldn't easily find out what was happening on campus. "The calendar was static and only showed basic event details," said Jason Cash, director of web communications at Hope College. "Because the calendar wasn't dynamic, people didn't look at it or share the events on it." Hope College looked into a number of event calendars, but most of them were variations of their existing calendar. Jason heard about Localist at conferences and through online recommendations. Hope College's marketing agency, EM2, also recommended Localist, as they had successfully used it with their other higher education clients. In higher education, you perk up once you hear someone's name a few times. Localist was the only platform that could fully integrate with our website's brand. Matching our calendar to our new website was crucial to us. -The IT department, who would help implement Localist. -The Events and Conferences team, who are the biggest players on campus for hosting events. "Localist was very responsive in working with our design agency," said Jason. "Their collaboration was seamless." I was skeptical that the template would exactly match the new site. But Localist gave us a lot of flexibility in customizing the look and feel of our calendar. When end users click between the website and the events calendar, they have no idea that they are on a completely different platform. Hope College integrated Localist with its room reservation system, EMS. To do this, the Hope IT team developed a feed from EMS to Localist. Now, when a staff member books a room, he or she can check a box to display the correlating event on Hope College's public calendar. Then, the event goes into the queue for approval. "Localist made it very easy to plug our EMS feed into our pending events queue," said Jason. Localist also worked with Hope's IT team to enable single sign-on, which allows students to log in to the calendar using their Hope College email address. This makes it easy for students to engage with events and for Jason to track logins. Students can also log in through their Facebook account and share events with their friends on social media. Hope College relies on the Localist API to send calendar feeds to different parts of its website, such as its home page and individual department pages. This makes it easier for visitors to find relevant events. 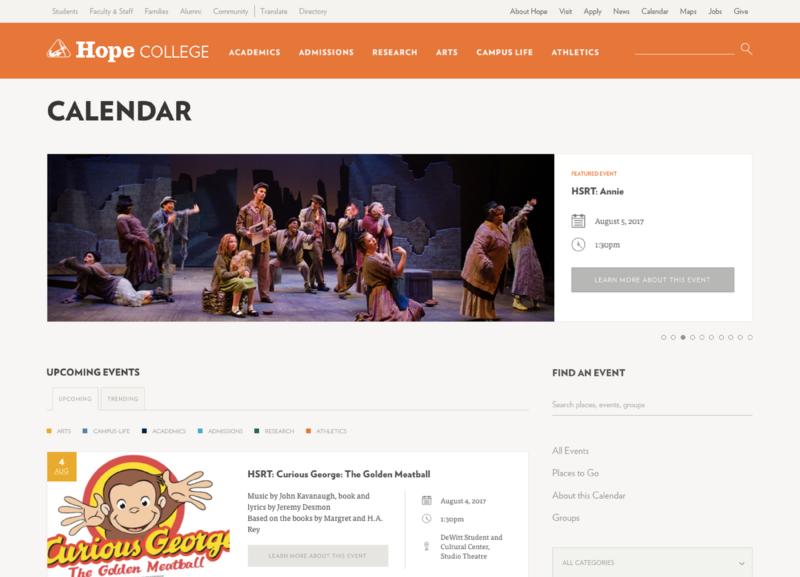 For example, the Hope College team tags events for specific departments. These events appear on a widget on the department's home page and are automatically updated when the event ends. "Localist's API has been a very powerful tool for us," said Jason. "It allows us to be hands off, as it automatically showcases the right events on the right pages." The Hope College team finds Localist so easy to use that the Public Affairs and Marketing team manages it without IT support. This frees up IT's time, as they don't need to handle day-to-day updates or provide technical support. "One person on our team manages the events. When he went on vacation, we had to make last-minute changes to a major symposium," said Jason. "The rest of our team had no problem using Localist to keep the public informed about these changes. On the rare occasion when we have a question, Localist support is always there to help us with it." In less than a year, Hope College has posted more than 2,000 events - a dramatic increase from the number of events listed in the old calendar. I'm amazed by how many more events are in the calendar. Being able to spread content throughout our site using Localist's API has saved our departments tons of time, as they no longer need to add or remove event listings. Staff members have told me that Localist makes their lives much easier. Localist's API also helps reduce Hope's IT workload, as web developers don't need to create custom feeds to distribute events to the right places on the website. Hope College uses Localist's Event Reach feature to ensure its events get to the right audience. Localist looks at audience awareness factors for each event, such as how many people view it and how discoverable it is on Google. "The Event Reach feature allows our Public Affairs and Marketing division to easily view event data, without needing extra support to do so," said Jason. Since launching Localist in August 2015, Hope College has seen strong numbers at many of its events. Localist helps boost attendance by providing a seamless user experience between Hope's website and events calendar, while making it easy for people to buy tickets. The new calendar gets 1,500 more page views per month than the previous calendar. We've always had these events, but now we have a user-friendly platform to showcase them. Localist automates many of Marketing's and IT's tasks. This allows our staff to be hands off while we drive people to our events from Google, social media, and our website. Jason plans to meet with every student group this year and coach them on how to use Localist. "Localist is hands down the best calendar platform out there," said Jason. "We did our due diligence and looked at a number of options, and Localist had the best features by far. We would highly recommend that anyone consider Localist for their calendar needs."